Tropical diseases such as malaria, tuberculosis, trypanosomiasis, and leishmaniasis, account for a large number of deaths annually. Herbs are an excellent source of tropical medicines. Many advancements and discoveries have taken place in the field of drug discovery but still, a major population of tropical diseases relies on herbal traditional medicine. There are some challenges related to policy implementation, efficacy, resistance and toxicity of tropical medicines. There are many tropical diseases such as such as schistosomiasis, leishmaniasis, African sleeping sickness, filariasis and chagas disease which are neglected because very few pharmaceutical companies have shown their interest in developing therapeutics against these diseases of poor people. There are many benefits associated with herbal medicine such as the cost of production, patient tolerance, large scale availability, efficacy, safety, potency, recyclability, and environment friendly. 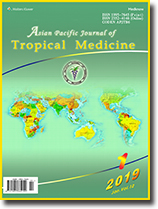 A large number of natural extracts such as curcumin, artemisinin, morphine, reserpine, and hypericin, are in use for treatment of different tropical diseases for a long time. 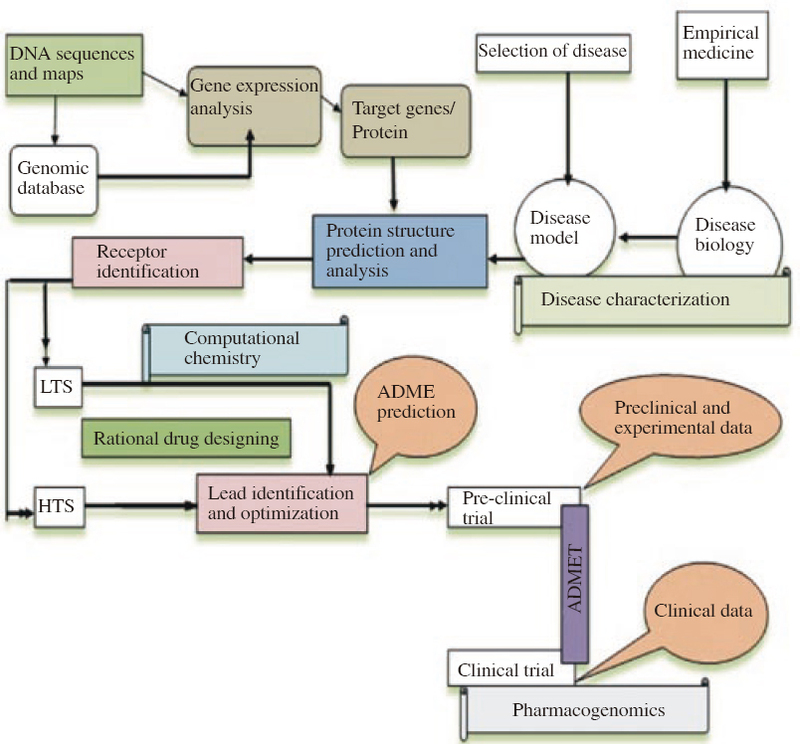 The current review is to discuss the overview of tropical medicinal herbs, its scope and limitations in the modern drug discovery process. Objective: To estimate the prevalence of antibiotic resistance of Neisseria species in Iran. Methods: A systematic and electronic search using relevant keywords in major national and international databases was performed until 6th July, 2018 in order to find studies reporting the prevalence of antibiotic resistance of Neisseria species in Iran. Results: A total of nine studies were found to be eligible based on predefined inclusion and exclusion criteria. Our analysis indicated that the prevalence of Neisseria gonorrhoeae resistance to different antibiotics was as follows: 66.9% to penicillin, 59.1% to ciprofloxacin, 11.1% to ceftriaxone, 21.6% to spectinomycin, 13.8% to cefixime, 82.4% to co-trimoxazole, 52.7% to tetracycline, 29.9% to gentamicin, 87.5% to ampicillin, 11.1% to azithromycin, 2.2% to chloramphenicol, 50.1% to cefepime and 50.0% to vancomycin. Antimicrobial resistance rates of Neisseria meningitidis was as follows: 30.0% to penicillin, 33.3% to amoxicillin, 33.3% to cephalexin, 55.6% to ampicillin and 0.0% to ciprofloxacin, ceftriaxone, cefotaxime, amikacin, co-trimoxazole, gentamicin, kanamycin, chloramphenicol and ceftizoxime. Conclusion: Neisseria gonorrhoeae and Neisseria meningitidis isolates of Iran show resistance to different types of antibiotics. Therefore, care should be exercised for the use of penicillin, ciprofloxacin, co-trimoxazole, tetracycline, gentamicin, ampicillin, cefepime and vancomycin for gonococcal infections, and also with respect to the use of penicillin, amoxicillin, ampicillin and cephalexin for meningococcal infections in Iran. Objective: To investigate the synergistic effect between rhein (RHE) and oxacillin against Staphylococcus aureus (MRSA) at the gene level. Method: A minimum inhibitory concentration and checkerboard dilution test were conducted to evaluate antibacterial activity. Reverse transcriptase polymerase chain reaction was conducted to investigate the gene expressions. Results: RHE exhibited a minimum inhibitory concentration of 62.5-250.0 μg/mL against various MRSA strains and the reference strain, respectively. As revealed by the checkerboard assay, a combination of RHE and oxacillin exhibited synergistic or partially synergistic effects against MRSA strains. 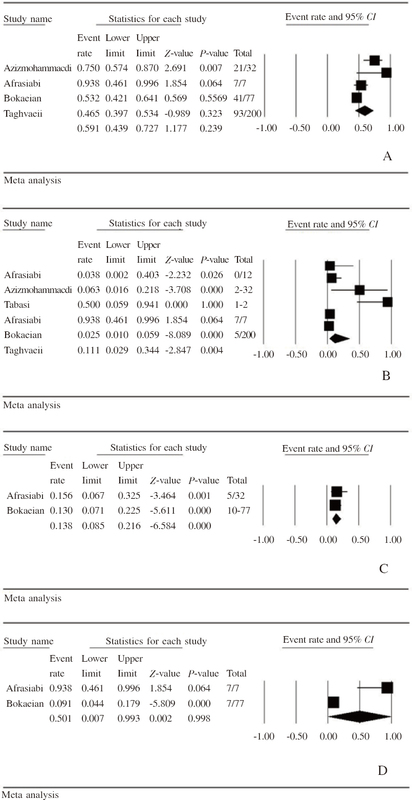 RHE decreased the expressions of mecA/blaZ in a dose-dependent manner. RHE also decreased the expressions of the regulator genes mecI/blaI and mecR1/blaR1. Conclusions: We suggest that RHE affects the activity of mecR1/blaR1, which is located in the cell membrane of MRSA and results in the suppression of mecA/mecI/mecR1 and blaZ/blaI/ blaR1 gene expressions. Objective: To detect the prevalence pattern of Chikungunya virus in three states of Northeast India. Methods: A total of 1 510 samples were collected from different private and government hospitals of Assam, Arunachal Pradesh and Meghalaya. Serum was tested for the presence of IgM antibodies against Chikungunya virus followed by RT-PCR for amplification of Chikungunya E1 gene region using specific primers. Results: Overall, 11.83% (172/1 454) clinical samples were positive by MAC-ELISA and/or RT-PCR assay. Asymptomatic infection was seen in 17.86%. Males were more affected than females and age group 16-30 years was mostly affected. Fever (100.00%) was the primary symptom followed by headache (72.03%) and arthralgia (41.53%). Only 118 Chikungunya positive cases could be traced, of which 25.42% complained about sequelae of infection. In entomological investigation, Aedes aegypti was more predominant (92.10%) than Aedes albopictus (7.90%). No mosquito pools could be incriminated for Chikungunya virus. Conclusions: In this study, Chikungunya was observed to be prevalent in Assam, Arunachal Pradesh and Meghalaya. Though Chikungunya is a self-limiting infection, increasing morbidity by CHIKV infection is affecting social and economic status of individual. Thus, a community empowerment to effectively control mosquito population by employing different mosquito control measures along with personal protection is mandatory to tackle future outbreak of the disease. 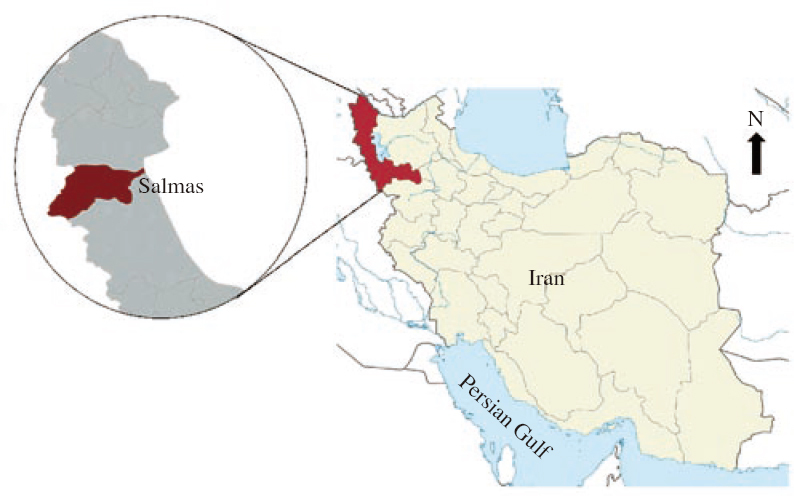 Objective: To identify serodiagnosis and quantification of Toxoplasma gondii (T. gondii) infection among pregnant women in Salmas, northwest of Iran. Methods: In this cross-sectional study, 276 blood samples were collected from pregnant women referred to the health care centers in Salmas city. The demographic variables were also recorded. Titers of anti-Toxoplasma IgM and IgG antibodies (Ab) were determined using the chemiluminescence immunoassay. Quantitative real-time PCR targeting the T. gondii repeated element gene was also performed on the blood sample. Results: Out of all, 19.92% (55/276) and 2.17% (6/276) patients were seropositive for anti-Toxoplasma IgG and IgM Ab, respectively. Moreover, the presence of T. gondii DNA was observed in 12.31% (34/276) blood samples. A significant relationship was observed between the IgG Ab seropositivity and contact with the cat as a risk factor (P=0.022). Conclusions: The seroprevalence rate of T. gondii infection in pregnant women is relatively low. Consequently, the seronegative pregnant women are at risk, and a considerable rate of positive blood samples for the presence of parasite's DNA should not be ignored. Besides, quantitative real-time PCR could be considered as an accurate method for diagnosis of acute toxoplasmosis especially when the precise results are of the most importance in pregnancy. Limiting contact with cats is also suggested for pregnant women. Objective: To investigate the cytotoxic, antioxidant and antibacterial activities of ethanolic and aqueous crude extracts of Nerium oleander (N. oleander) leaves. Methods: Cytotoxic activities were evaluated by WST-1 bioassay on two human cancer cell lines, namely human colon adenocarcinoma cell line HT-29 and human breast cancer cell line MDA-MB-231. 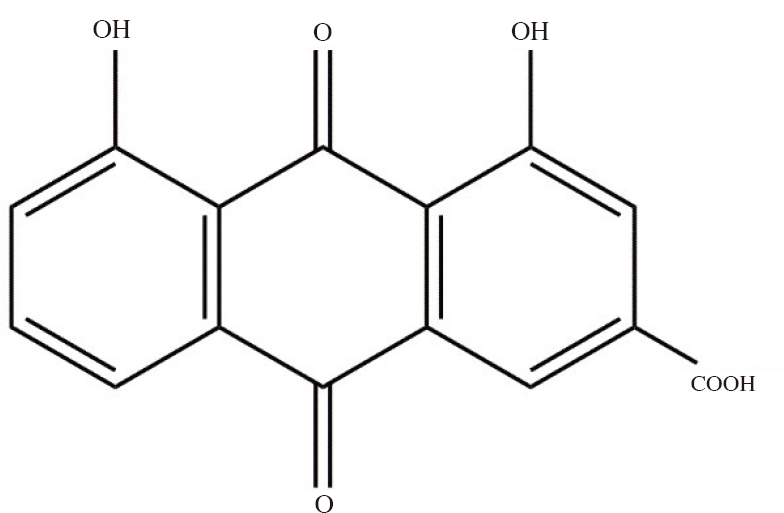 The antioxidant property of N. oleander extracts was assessed by DPPH scavenging and β -carotene bleaching tests. The agar disc diffusion method was used for the determination of antimicrobial activity against different strains. Results: Using cell viability indices, the WST-1 test revealed that both extracts reduced cell viability in both cell lines. Our results also showed that aqueous extract was more active than ethanolic extract, with IC50 values of (1.67±0.22) μg/mL and (2.36±0.44) μg/mL on MDA-MB-231 cells, and (2.89±0.35) μg/mL and (5.09±0.52) μg/mL on HT29 cells, respectively. The study of the antioxidant activity showed that N. oleander extracts had a considerable scavenging capacity and exerted a significant preventive effect against the oxidation of β -carotene by the peroxide radicals. However, the antibacterial test showed that both ethanolic and aqueous extracts of N. oleander had a moderate antibacterial effect limited only to Gram-positive bacteria. Conclusions: Our results shows that N. oleander aqueous and ethanolic extracts have significant cytotoxic activities against tumor cell lines and possesses a strong antioxidant capacity, suggesting the presence of active compounds in N. oleander leaves that could be a potential source of phytochemicals with high medicinal value to be used in cancer treatment and prevention. Objective: To study the distribution of human leptospirosis cases across the different geographic regions in the Philippines in 2015-2017 and to determine the relationship between the frequency of typhoon occurrence and human leptospirosis cases. Methods: Information on the frequency of leptospirosis cases and typhoon occurrence across the different regions in the Philippines from 2015 to 2017 was retrieved from the databases of the Department of Health and the Philippine Atmospheric, Geophysical, and Astronomical Services Administration, respectively. Descriptive measures on the prevalent cases and occurrence of typhoons across the different regions were summarized. Linear regression analysis was employed to establish the functional relationship between leptospirosis cases and typhoon occurrence. The distribution of human leptospirosis cases was assessed using the Poisson distribution. 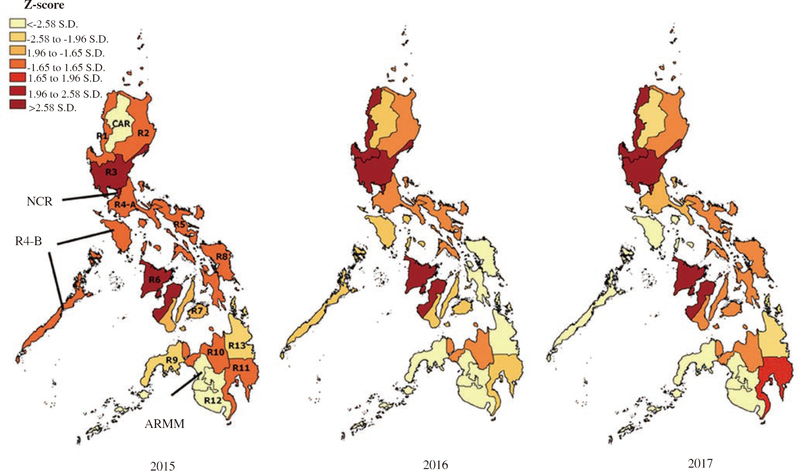 Results: The frequency of typhoon occurrence accounted for the significant linear variation in the geographic distribution of human leptospirosis cases in the Philippines (P<0.001). Moreover, the human leptospirosis cases obeyed a Poisson distribution (λ=6.89, P<0.001). Conclusions: The Philippines has frequently experienced severe weather perturbations such as typhoons resulting in flooding and subsequently increasing the risk of transmitting bacterial infections including leptospirosis. Information obtained regarding the determinants and distribution of human leptospirosis will provide better understanding of the disease propagation for subsequent design of optimal disease prevention measures, appropriate resource allocation, effective control strategies, and necessary public health programs. Objective: To evaluate the susceptibility of Anopheles stephensi (An. stephensi) Liston, the main malaria vector in southern Iran, to WHO recommended insecticides. Methods: Larvae of An. stephensi were collected from three different larval habitats in both urban and rural area of Bandar Abbas city and one rural area in Rudan county southern Iran. WHO standard method was used for evaluation of adult and larval mosquito susceptibility. Bendiocarb, permethrin, lambda-cyhalothrin, deltamethrin as insecticide and temephos and chlorpyriphos as larvicide were used at the diagnostic dosages recommended by WHO. Results: Findings of this study showed all larval populations of An. stephensi were completely susceptible to temephos and candidate for resistance to chlorpyriphos. 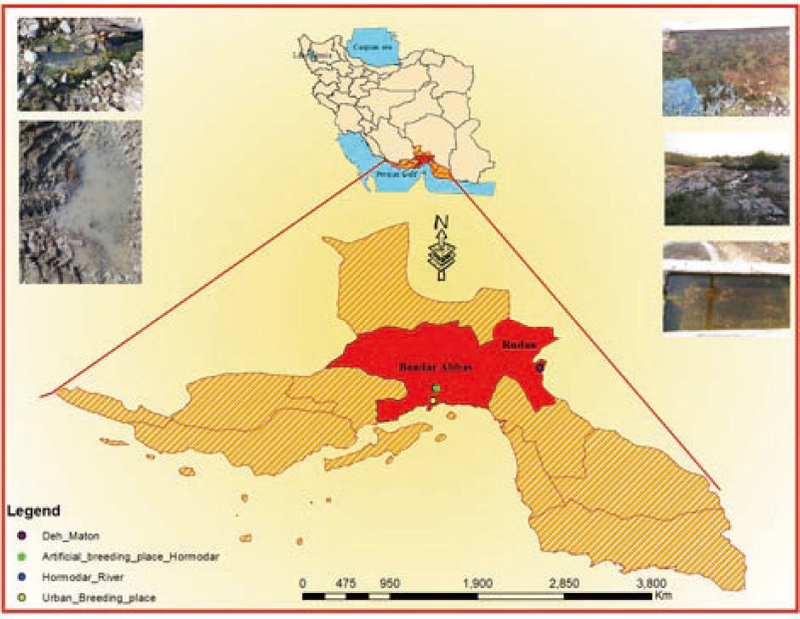 Adult mosquitoes in rural areas of Bandar Abbas city were resistant to pyrethroid and carbamate insecticides. Conclusion: Comparison of the results of this survey with previous studies indicates that the resistance to pyrethroids and carbamates in this malaria endemic region is increasing. Wide use of pesticides in agriculture is certainly effective in increasing resistance. The inter-sectoral coordination and collaboration in health and agriculture seem to be necessary to manage insecticide resistance in malaria vectors.